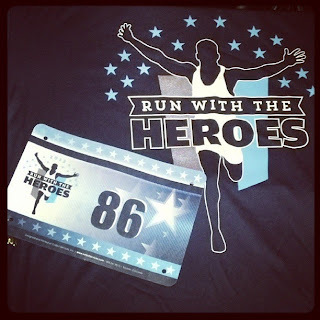 So, this morning was the Run With The Heroes 5K. Unbenounced to me, I could have signed up as a Police competitor and been eligible for potential awards under that heading. So, there is actually 2 sets of results for my race today because the results they posted on site were separated between the general registrants and the police/fire/ems registrants. I’ll get to the results in a little bit, though. I rolled out of bed this morning, started the coffee and mixed up the oatmeal. I got dressed in my running attire and strapped on my chest strap and my Garmin. Then I headed out the door and made my way across the city to the race site. I parked and located (by way of the mass amount of people going in and out of it) the suite where they were doing the packet pickup and got my bib and packet (with technical shirt!). Then I started looking for other Team Sheriff runners and found a good number of them. We took a group photo (if I can manage to find a copy of that picture, I will post it, but I don’t know who took the picture, so I may not be able to) and then milled around waiting for the race to begin. And we were off! I held back a little bit, but also let myself go a little bit. I looked down about a quarter mile into it and I was cruising along at around 9:30 min/mi!! Whoa! But, I felt good. I wanted to slow down so I didn’t burn myself out, but I also wanted to see how long I could hold that pace. So I kept it up. APD had 2 platoons of cadets running in formation and calling cadence. A little over a mile into it, the first platoon caught up to me. I made the decision that they weren’t going to pass me…so I paced with them. Only downside to that was, they were calling cadence…and they were LOUD! I couldn’t hear my music over them half the time. Hahaha! In fact, I almost paused my music. I love cadence. 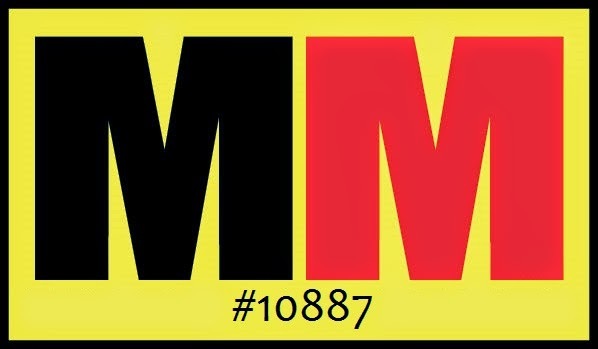 It brought back great memories of being in boot camp and job training for the Army. I almost teared up more than once as a result. Anyway, I kept glancing at my Garmin and I was holding steady at around the 9:30 mark. And every time I glanced at it, I was amazed at how far I had gone and how much closer I was to the finish. I was going so much faster than I was used to going! At the start of this, I told everyone I was hoping to hold a 10 minute pace. So, we came up to the 5K mark (which wasn’t where the finish line was). 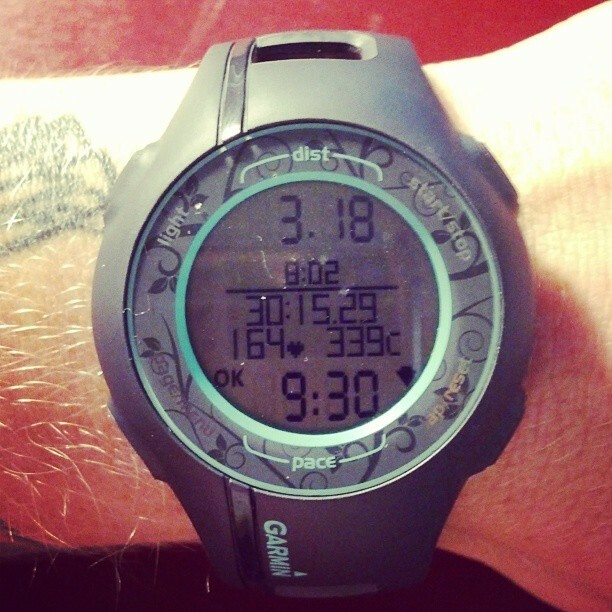 I was watching the timer on my Garmin when I crossed that mark and I hit 29:28. Obviously an official PR. I’ve only run one other 5K and my finish time for that was 33:30. Anyway, my “finish line” time was 30:15 per my Garmin (30:13 per the official results). The distance at the finish line was 3.18 miles. They had the APD bagpipers there, but I only got one shot of one of the ladies on the squad…a lady in a kilt! Interesting. 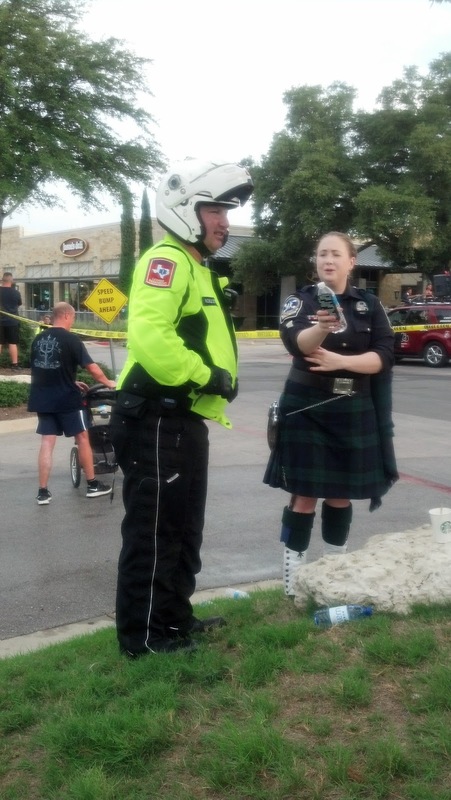 And then, there’s a motors cop next to her. They also had the new all-purpose police helicopter on site (I didn’t take any pics of it, sorry)…but it was pretty cool because it can do police work, rescue work and fire support! So, after the race, we all gathered to where they were presenting the awards. Like 5 or 6 Team Sheriff people placed. Awesome! We had been looking everywhere for the full results to be posted but couldn’t find them. Finally, after all the awards had been presented, someone told us where the results were posted. Like I mentioned above, they had the results separated into two groups. One group was the general registrants (of which I was in) and the other was police/fire/ems registrants. I found my name and I was ranked 104 overall (of the general registrants, that is…actual overall place was 153 out of 441) and I was FIFTH out of 23 in my age group!!! 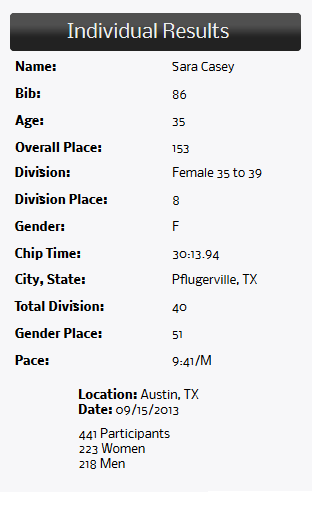 (8th in my age group with the general and police groups combined into one) OMG!!! If I could have pushed myself to do a 9 min/mi pace, I might have gotten a medal!!! So, we know what my goal is for next year’s Run With The Heroes!!! A 9 min/mi pace. I can do it! Okay, non-race stuff from today to close this out with…I was supposed to go for sushi with some people from work. However, on my drive over to the restaurant, I received a text message saying that it had been canceled. Ugh. But, at least I didn’t get the notification once I was already at the restaurant. So, I turned into my favorite burger place in my town (Moonie’s Burger House) for a burger instead. I had planned to go there for a burger during the next 2 weeks that I’m off work anyway. Then, I decided to go to my nail place (which is in a Wal-Mart), but they were packed, so I wandered around the store instead to see if anything caught my eye…and to just waste some time. 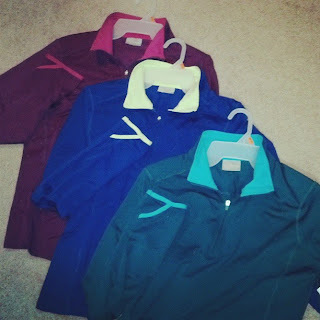 I found some long sleeve running pullovers…for $10!!! So I bought 3. YAY! Now I have 4 running pullovers. I’m set for cold weather running (when and if it happens…teehee). Then, I went to Party City to look at their costume pieces to see if they had any good cat ear headbands. Nope. They had one set and they were super cheesy looking. I’ll just find some online. Then, I went next door to Ross to wander around a bit. 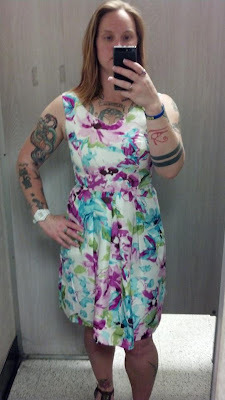 I went to the dresses first and found a few that I liked, so I took them to the dressing room. 2 of them worked for me and one didn’t. One of the ones that worked for me is a SIZE EIGHT!!! It was a little snug, but you know what? It zipped all the way up and I could move and I could breathe comfortably. It was just snug. And it looked great on me! Oh, and it has pockets. I love a dress with pockets. 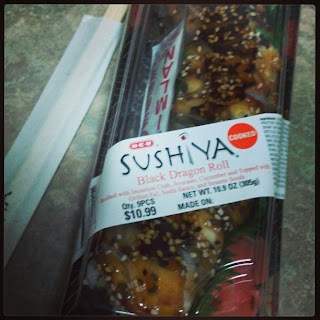 On my way home, I stopped at the grocery store (HEB) to pick up some sushi and some cheesecake. I went to the sushi counter and looked at their options, but I didn’t see any unagi (eel)…my favorite. So I asked the lady and she said she’d make me an unagi roll. SCORE! 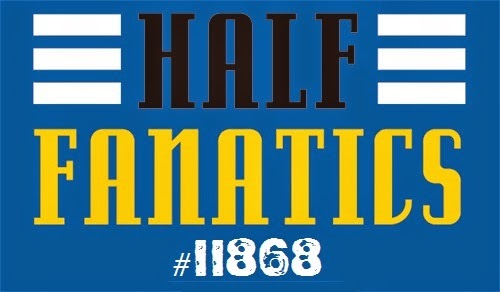 So, I’m just going to chill and rest for the remainder of the day so my legs are good for tomorrow’s 13 mile run. I think I’m going to do a complete loop of the lake (Mopac to Pleasant Valley) and then a second “loop” between Mopac and Lamar. So, my total mileage should be around 13.2 or 13.3. I’m also going to make a point to walk for about 10 minutes afterward so that maybe my legs won’t be super stiff after my drive home.